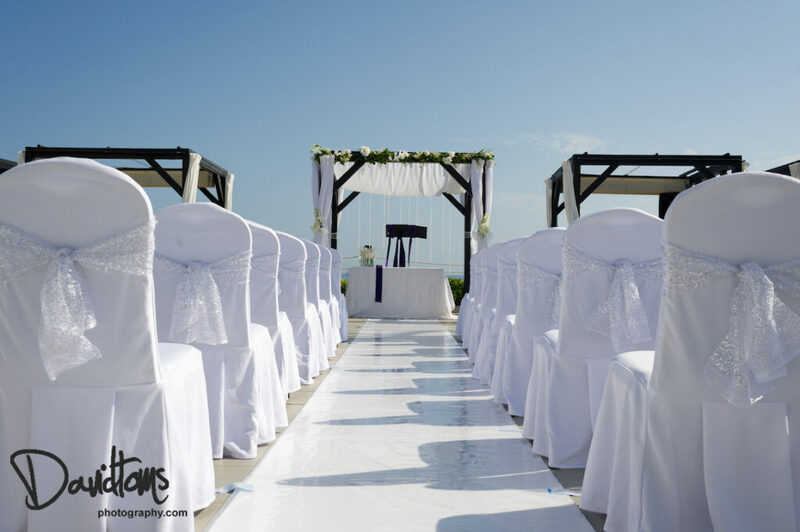 As one of Spain’s leading wedding planners, not a lot phases us…but we were surprised and over the moon in the spring of 2015 when we received a phone call from the producers of The Only Way IS Essex, Lime TV who were filming a new ITV reality show called Life On Marbs. As most of you TOWIE fans know, Marbella is synonymous with glitz and glam and many of our couples love the idea of a beach wedding with a bit of pizzazz (although there are plenty of rustic and mountainous venues/villas on the Costa del Sol to enjoy an alternative style wedding). Having done their research the TV production company recognised Sunshine Weddings Spain as the most longest standing wedding planners in the south of Spain with a reputation for impeccable planning, professionalism and making any wedding lots of fun, which is why they wanted us to help plan the wedding of two of their stars – Cassie and Mike. And of course we said YES. Here are a selection of photographs of the Marbella wedding venue that Cassie and Mike have chosen. Above is the ceremony area, and below are images of the dining area by day and also by night. For those of you that didn’t catch the series last summer, Life on Marbs featured an episode with our wedding planner Scott talking to Cassie and Mike about their upcoming nuptials. There was a tearful moment when Scott asked the bride who was going to be walking her down the aisle as Cassie’s father is undergoing treatment. Scott dealt with the sensitive subject, like any good wedding planners would, with professionalism and kindness and the episode took us through the couple’s plans for their unforgettable big day. It was such a pleasure appearing on the show and we are still busy off-air planning their dream day. Take a look here at Cassie and Mike’s wedding planning with Scott and look out for the new series returning in the summer of 2016 where you can join the couple on their Marbella wedding day and watch Scott and the team at work. We can’t wait to see Cassie and Mike in the sunshine again and see all our hard work pay off during their big day on the big screen!